HTIL provided several educational necessities (books, pens, pencils, writing paper, etc) to students in the Barrett Town community - which was a delight for the students. 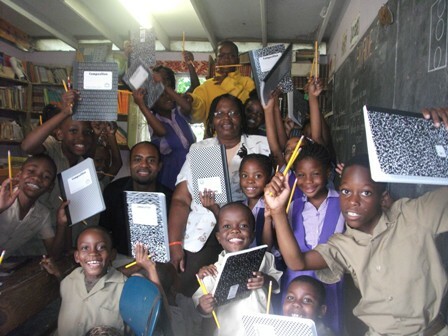 Major handouts were given to students of the three schools in the community: Rose Hall Basic (Kindergarten), Rose Hall Success Primary, and Barrett Town Primary. Other handouts were given to students attending Middle/High School (especially, those students who participated in HTIL’s summer soccer camps). Overall, more than 500 students benefited. The schools (principal, students, teachers) and parents have expressed their gratitude for these invaluable items - geared to foster students success in education. HTIL would like to express its gratitude to all who assisted to make this possible. This was truly a honorable assist!